 Follow us to WIN prizes! V&A’s Downtown Kalamazoo is where it all started. We’re located on the Famous Kalamazoo Mall just a ½ block south of the Radisson. Bill Van Dis, Tom Morin, Frans Vander Wal, and Elliott Miller lead the friendly Downtown staff. Visit us Downtown for Art Hops, Food, Fun, and of course the “Shoes That Fit Your Life”..
V&A’s largest store is at the Southland Mall. You know all of the great shopping around V&A – Crossroads Mall, Old Navy, ULTA Beauty, MC Sports, & more! Jeff Gibson leads the veteran staff that includes Bill, JS, Mike, Wendy, Jack & Samy. Easy storefront parking is always a hit. 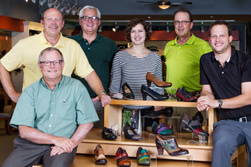 So stop in to find the “Shoes That Fit Your Life”. V&A’s newest store is on 28th Street in a great location between Fox Ford and Outback Restaurant. 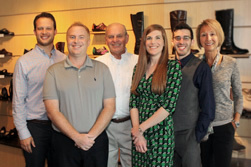 Fourth generation owner Dan Van Dis leads the energetic staff of Lisa, Bo, Mary, Ruth, Kaitlyn & Bree. We know you will love the comfortable décor and friendly staff. 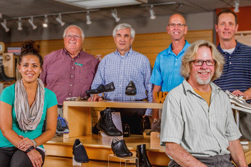 Stop in and find the “Shoes That Fit Your Life”.